William Earle Williams gave a lecture on the process of curating his exhibit. 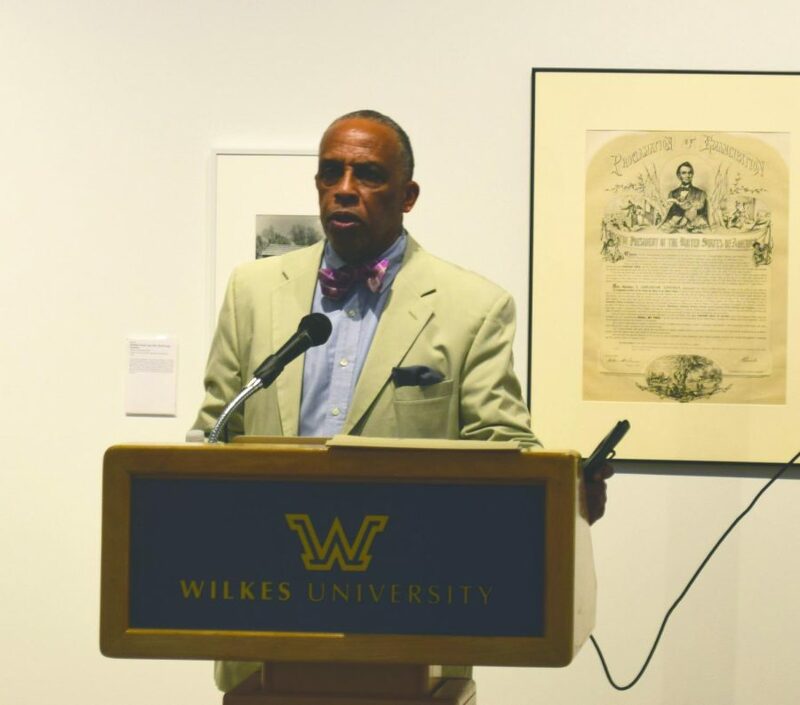 “My hope is that when you come in contact with the work, it can bring something out of you, that you may not have noticed before” said Professor William Earle Williams, as he started his lecture at the Sordoni Art Gallery on Sept. 5. Williams is a professor of fine arts and curator of photography at Haverford College in Haverford, Pa. and Audrey A. and John L. Dusseau Professor in the Humanities. He has been affiliated with the college since 1978, soon after receiving his M.F.A in photography that same year from the Yale University School of Art. His photographic works, as well as other pieces, invite recollection of the age of slavery. Thus his art, alongside related historic artifacts, attempts to depict the often unknown journeys from slavery to freedom in the United States. Further, it is presented to encourage conversations about citizenship, while broadening our knowledge on the participation of blacks in the Civil War. He accurately showcases his work in a deeply personal way. His lecture, as well as the exhibition at our gallery, gave way to historic events that spanned from 1619 to 1865–and beyond–to unravel at the audience. Williams opened the lecture with a photograph captured at a deceiving angle: one can see a lone tree, erected in the exact middle of the plane, rather slim at the trunk, yet seeming to branch out, with many leaves. The photograph actually shows two two trees. His intention, though, was to bring attention to location of the photo: Jamestown Island. This exact location is one of the first recorded places where people of African descent first stepped into the North American soil. It also happens that this particular spot later became a Civil War fort that was later built by enslaved people. “Free” slaves also made use of this fort, but this time as participants of the Civil War. The were indentured into fighting the war, and it was an extension of their enslavement. On May 22, 1863, the Department of War of the United States established a Bureau of Colored Troops, so to organize and recruit African American soldiers to fight for the Union Army. All regiments designated for African Americans were termed as the United States Colored Troops (USCT). Specific battle sites, some of which were captured by Williams as apart of his work, were built with the sole intention of being utilized by these black soldiers. “I find that the primary artifacts I use in my work, such as an 18th century map, are perhaps as revealing as photographs can be,” Williams said. The map that Williams was referring to is a map that was made in 1730, detailing slave trading areas from central Africa. “[The map] is so detailed that it tells you the exact different tribal peoples, and their vernacular languages,” he added. One can only get so far by looking at photographs, so, in addition, to further understand visual culture of the slave epoch we have to have some familiarity with its roots in the West Indies. The agriculture tradition and its use of slave labor in Britain, seem perpetuate the practice of owning slaves worldwide. Among his other artifacts is the U.G.R.R book, a book that recounts the history of the Underground Railroad. The Underground Railroad was a structure of different routes and safe houses established in the 19th century, for African-American slaves to escape to Canada or the northern free states. The Underground Railroad is one of the American history’s finest examples of the struggle against the institution of slavery. This “invisible” railroad was composed of women and men, both black and white, and persons of all ages. They put their moral beliefs well beyond their personal safety to help these slaves reach freedom, and after the approval of the Fugitive Slave Law in 1850, these routes became even more illicit in the eyes of the law. Williams alluded to the fact that slaves played a substantial role in the economic development of 18th century America. One object in particular, an Alabamian $10 bill, demonstrates this point. Though George Washington’s face is seen printed in the bill, one can also see slaves (and their masters) at work picking cotton. “Many American historians consider the periods from 1787 (when the articles of the Confederation were modified to become the American Constitution) to 1865 (when slavery was no longer legal) to be the second American Revolution,” stated Williams. A seemingly normal black-and-white picture of part of a cemetery was portrayed, however, the meaning of his discourse changes when he indicates that this section was almost exclusive to the freedmen in the area of Arlington, Virginia. According to Williams, this is significant because the African-American people, for the first time, started to leave their mark permanently in the communities that they lived in, even if that took the form of a gravestone. “As an artist the memory of these soldiers has inspired my artistic imagination. The ground they fought on is sacred and an inspiration for all Americans. These sites dispel the myth that blacks were given their citizenship and rights after the Civil War without having fought for and earned them,” he explained. “The act of researching and locating these sites was the starting point for my creative investigation” he said. “The resulting photographs have become more than just documents.” He describes his photographs are story-charged, and hopes the audience is as committed to connect with the pictorials as much as he has been. His photographs have been widely exhibited, including group and solo exhibitions at the Cleveland Museum of Art; Museum of Fine Arts, Houston; Smith College. His photographs are in many public collections including the Philadelphia Museum of Art; Brooklyn Museum; Baltimore Art Museum; Baltimore County; the Smithsonian, Castle Building; Metropolitan Museum of Art; Princeton University Art Museum; the University of Maryland, The National Gallery; and George Eastman House. Williams’ exhibition will be on display until Oct. 7. Upcoming exhibitions include “Loud Silence: Expressions of Activism” curated by Sordoni Art Gallery Director Heather M. Sincavage. This exhibition will be held from Oct. 23 to Dec. 16. This exhibition focuses on works that portray the obstacles of those who live while being women, black, LGBTQ, immigrants, and indigenous. The exhibition features over forty different artists including Kiki Smith, Judy Chicago, and more.